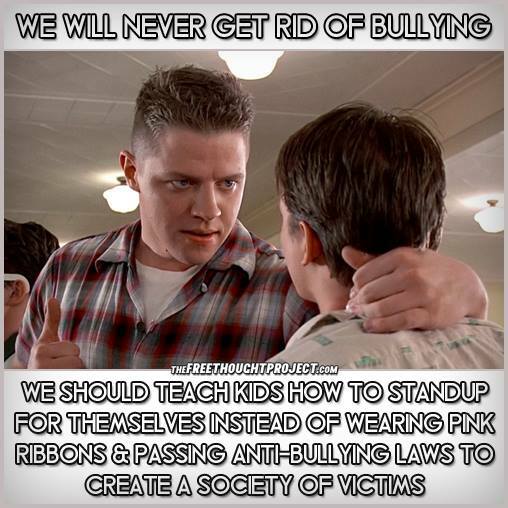 In an effort to control perceived growing violence in schools, Congress passed the 1994 Gun Free Schools Act (GFSA) which required states to implement zero tolerance policies on school property as a prerequisite for receiving federal aid from the U.S. Department of Education. In 2002, Congress repealed this version but reauthorized the zero tolerance requirement under the No Child Left Behind Act. The revised bill expanded the school’s jurisdiction for such offenses from school property to any school-related function. So under the No Child Left Behind Act, school districts would not receive federal funding unless they implemented zero tolerance policies with a mandatory one year expulsion for any student who brings or possesses any firearm on school property or at any school function. School officials are also required to report these offenses to law enforcement agencies. Atiya Haynes, 17, was caught with the pocketknife at a homecoming football game in late September at Annapolis High School in Dearborn Heights, Michigan. School officials were searching the bags of female students exiting the restroom after a security guard claimed to have smelled marijuana nearby, according to local outlet WXYZ-TV. When officials searched Atiya’s bag, they found no marijuana, but did find a small knife. In 1998, a Colorado school expelled a ten year old student when her mother inadvertently packed a small paring knife in her lunch. Despite trying to do the right thing by turning it in, she was expelled under zero tolerance policies and school officials said they had no discretion. While the expulsion was eventually overturned, her family was forced to move after receiving harassing letters that her family was trying to destroy the school. In 1999, a Florida high school student was suspended for one year for bringing nail clippers to school. This expulsion was also reduced to a ten day suspension. However, the principal of the school was quoted as saying that he “was not…ready to arm kids with more ammo, to bring more items on our campus and make it an unsafe place.” Forget the fact that the student never used the nail clippers herself. Did I mention that her “crime” was bringing nail clippers to school? Nail. Clippers. This is the kind of “dangerous” activity we are trying to protect students from? Let that one sink in. In 2013, two Virginia middle school students were suspended for nine months for shooting airsoft guns (similar to BB guns) in their front yard. The school claimed jurisdiction because the bus stop was in front of their house. In 2012, a six year old student in Maryland was suspended for pointing his finger in the shape of a gun and saying “pow.” The principal sent a letter home to the parents stating that the boy “threatened to shoot another student.” Yes, this will be on this boy’s permanent record. Similarly, a seven year old Maryland student was suspended in 2013 when he bit his pop tart into the shape of a gun and said “bang bang.” These two events led Maryland State Senator J.B. Jennings (R-Baltimore) to introduce the “Reasonable School Discipline Act of 2013” to the Maryland Legislature, which would prohibit schools from suspending or expelling students who use any object that resembles a gun, but serves another purpose. In other words, the bill requires school administrators to use a little common sense. Has it really come to the point where we need such legislation? In 1999, a Missouri high school junior was suspended for ten days when he responded “yes!” to an online message board asking whether students thought that a Columbine incident could happen at their school. As a result, he became ineligible for the National Honors Society and missed taking achievement tests which would have placed him in college level courses. Finally, we saw the post made by Tom Knighton yesterday about the five year old student who was forced to undergo a psychological evaluation and sign an agreement to not harm anyone or herself because she drew a picture of a gun and held up a crayon, saying “pew pew.” She is five! According to the National Association of School Psychologists, students who are suspended from school are more likely to suffer psychological disorders such as depression and anxiety from being ostracized. They are also much more likely to wind up in the juvenile justice system and therefore, the “playground to prison pipeline.” The American Psychological Association’s Zero Tolerance Task Force further found that zero tolerance policies had the opposite effect on preventing school violence. This is just another example of overreaching state power and the government, in its “infinite wisdom”, thinks it knows best. We would be better off to eliminate or reduce zero tolerance offenses. Our kids and future generations will thank us. In reaction, the school reportedly had the daughter evaluated by a psychologist and had the daughter sign a contract stating that she would reach out to someone should she want to hurt herself or another. Such contracts are fairly standard for people with mental health issues involving suicidal or homicidal intentions.